The pendant will have the most dynamic and useful energising effects for people with low chi due to geopathic and/or electro-magnetic stress as well as people with constitutionally low chi. Often they will work best if worn all day and night. The benefits of a plentiful chi energy includes both mental (emotional) and physical well being. They tend to boost good mood. 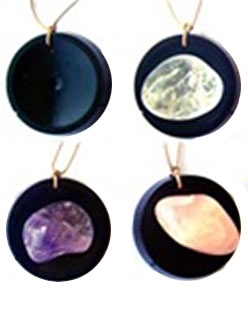 Chi Life Energy Pendants are not designed to re-structure the aura or energy field of the person (although they probably do have some balancing action in this respect) they are designed to provide an actual source of chi/orgone/life energy. For most people we recommend that they wear the pendant suspended in the heart area (top 1/3 of the middle of the chest) the effect is more dynamic and potent and the energy is well distributed. Simply place the pendant on a flat surface with the concave side up. A quartz crystal (Clear/Rose/Amethyst) is then placed on the pendant. You can experiment with combinations of crystals but we would not recommend more than 3 are used at any one time as too many different energies at once will produce a heavier less uplifting energy. Changing single crystals periodically is our recommendation if you are inclined to experiment. Clear quartz is the basic one to use, and in the long run is all that is necessary. However, if you are sensitive it will be easier to adapt to the energy of amethyst or rose quartz first. Another way to adapt is to start with a small quartz crystal of 5 to 10 grams and replace with a larger crystal once adapted. The larger the crystal the more energy is created. It is suggested that the pendant and crystal(s) be energetically cleansed at least every 2 or 3 months. This can be achieved by placing in a container under a very slow running tap for about 15 minutes. It is especially important to have a Room Charger in any room where geopathic/electromagnetic stress is dominant, home offices and rooms with computers are a good example. For small houses that do not have concrete or brick internal walls, one charger with a large crystal (25-35g) may be all that is required to charge the whole house. It is best to keep these devices at least a few feet away from electrical devices so the energy emitted is of a more predictable nature, especially in the bedroom at night. This includes keeping away from artificial magnetic fields such as found in speakers, electric clocks, radios etc. If all your available surfaces are home to one form of electrical device or another including mobile phone then the room charger can be placed on a chair or even on the floor. We are just as much bio-electronic beings as we are bio-chemical. The bio-electrical side of our functioning underpins everything we are physically, mentally and emotionally. The bio-electrical body is complex. On one hand, throughout the ages traditional healing systems have incorporated felt and intuitive understandings of energy as a core of the human health and ecology such as the concept of chi or prana energy. Today bio-electricity is at the beginning of an emerging science where our modern instruments struggle to but have mapped out some of the fundamentals of this important aspect. Examples include several different types of direct and alternating electrical currents and also electric charges used in the bodies regulation. Even a kind of coherent laser light the cells emit for the purposes of communication (Its funny isn't it ? man invents what nature beat him too such as laser light used in fibre optic cable for communication). Then there are the many different brain frequencies. Forms of electromagnetic like energy also exist in the body that our equipment is only just starting to be able to measure, these fields are related to life energy principles as established by the Chinese system of chi. The body also produces D.C charges and currents from minerals in food. The important thing to realise as far as the health is concerned is that we are functioning electro-magnetic entities, a mass of unseen energies that interact with our environment. There are many types of electro magnetic, and electric charges in the natural environment and as Dr William Rich and other researchers have established a background pool of energy akin to electric charge (but not the same) that supply us and interact with our energetic functioning. This is known as orgone or chi or Prana. Since our industrial revolution with the plethora of man made electrical and electro-magnetic emitting devices surrounding us that have been developed without any regard or hardly any knowledge of their interaction with our internal ecosystems, we have been subjected to the most unnatural and disharmonious energetic fields. These have profound effect on our internal functioning and our health. We are in practice, not able to isolate ourselves from all of these influences, but the good news is there are measures we can take to offset and even transform these stressful energies into positive energies that support our internal energy system and hence our mental, emotional and physical well being. Even nutritional status is influenced by the bio-electrical aspect, so even though we may have the best nutritional profile possible, full health cannot emerge until we have corrected our bio-electrical aspects. Chi-Life energy pendants are made from coconut charcoal, epoxy resin, pollen and a steel disc incorporated internally. Charcoal (vegetable carbon) has been used by various cultures since antiquity, for energising the person, such as by Egyptian Temple Priests, druids and so on. Its use has re-surfaced in various ways, e.g. used by some Indian magnet therapists and others. Carbon attracts energy (chi) to and from the body by being held or in close proximity to the body. It has been used largely in a polar way i.e. to hold in one hand and to hold magnet or metal in the other to pull the chi across the body. Research done by myself finds a benefit from combining the charcoal and metal in one disc and that the gradual application of this energy via the centre of the body (e.g. in the upper chest area) provides a balanced energy. In the 1930's to about 1950's William Reich, an Austrian Scientist identified an energy associated with living organisms, and found ways to attract it from the environment and amplify it to raise the vitality of his patients to help overcome diseases including cancer. He called this energy Orgone energy. This energy is widely recognised as being the universal chi or prana that helps living creatures to function and stay alive and runs through the centre of ancient Chinese, Japanese and Hindu healing systems and philosophy. Following on from his work in the 1980's it was discovered that the organic material could be epoxy resin (Epoxy resin contains 50% carbon the essential element of all organic materials) and if metal fillings were mixed with epoxy resin once set into a variety of shapes, with the addition of a suitable crystal would act as a radiator of energy. Such composite material is referred to as Orgonite. By placing crystals within the epoxy the resultant energy would be potentated in a way that mitigated geophatic and electromagnetic stress, these devices are used to 'energise' rooms or even whole buildings. The effect is potent and sensitive persons can take up to about 2 weeks to adapt to this energy. Periodically from the early 1990s onwards till now (2009) I have experimented with carbon for energising the body, and latterly for room energisers, similar in modus operandi to the epoxy and steel devices. I have also been experimenting with energy pendants periodically over this period of time. Recently I have established that pure carbon manufactured for the electrical industry as a pendant did create a balanced calm energy. All other pendants I have developed or purchased that I have tested seemed to distort my energy field in one way or another, either draining or over-stimulating. It is my contention that only a person with experience in testing pendants (and this requires sensitivity and the development of self observation in a low stress environment) can develop and release a successful pendant. Normally pendants are manufactured from an idea and found to promote some seemingly beneficial short term changes in people. That is not to say that there are no long term benefits from some pendants-by in large pendants will distort or help to re-balance the energy field i.e. alter the way chi (or orgone or aura etc.) structured in the person. People have also reported that wearing a charcoal and steel based pendant, electromagnetic stress from working at a computer is reduced. When the pure carbon pendant was replaced with a natural carbon pendant e.g. coconut charcoal (although I have little doubt that any wood charcoal would work well) the balanced increase/stimulation of the life force was appreciably greater. It was also found that such a pendant suspended in the heart area (approx top 1/3 of the middle of the chest) the effect was much more dynamic and potent and the energy was well distributed, compared with if the pendant was kept in the stomach area or in a pocket. It has been found that incorporating crystals into the pendant for further energisation/structuring of the Orgone /chi is too stimulating and stressful Emphasising the need for a pendant that just supplies balanced chi and not to re-structure the energy field with the use of crystals close to the body. Pollen from wild flowers has been added to the charcoal and found to further increase the vitalising effects, and be well integrated and balanced. Pollen contains vitalising substances suitable to create new plants, and is also completely balanced nutritionally and energetically, it is a pure vitaliser. Its long term consumption is associated with increased longevity. It was for these reasons that pollen has been tried and tested in the charcoal and steel pendants. For sensitive people having fresh new energy coming into the system can seem overly strong or disturbing in some way. In this situation bear in mind this is just the adaptation or topping up experience/phase. Once the system has topped up then these feeling will no longer occur. During the adaptation period, this can be from a few days to a week or so, the pendant can be taken off when discomfort arises and put back on a few hours later. Alternatively the pendant can be worn for about 2 hours a day as an example for the first few days then gradually increase the length of time worn. Eventually, the pendant should be worn all waking hours for the best effects, however where there is strong geophatic or electromagnetic stress or to give a stronger boost to chi it can be worn at night as well. Wear the pendant all day every day for best results, however where there is strong geophatic or electromagnetic stress or to give a stronger boost to chi it can be worn at night as well. Room/house field ‘chargers’ have been in use for a few years using ‘Orgonite’ technology and consist of an epoxy base (50% carbon) and some metal and crystals e.g. quartz or amethyst being typical. These are a development on from William Reich's work in concentrating natural chi or orgone in an area using alternate layers of organic (carbon containing) material and metal. This occurred in the late 1990's other researchers began creating a matrix with the same properties as Reich discovered, by mixing epoxy resin and metal shavings—the epoxy providing the organic layer. In 2000, a couple named Don and Carol Croft discovered through some research and empirical observation that mixing epoxy resin with metal shavings, poured into small molds would produce a substance which would attract chi or Orgone energy similarly to Reich's accumulators. Carol Croft, gifted with a keen sense of discrete energies, realized the significance of this finding and took it a step further by adding small quartz crystals to the mixture for their ability to efficiently collect, transmute and emit etheric energy. This addition to the resin/metal matrix creates a substance which functions as a self-driven, continuously-operating, highly efficient transmutor of harmful or toxic energy to positive energy. When Orgone/Orgonite is within range of a source of contaminated energy (Toxic chi or toxic orgone), it will efficiently and continuously transform it into beneficial or positive energy, and irradiate the local area with this beneficial energy. These devices produce a feeling of fine uplifting energy that can effect a whole house or at least a room they are placed it. Sensitive persons may find the energy feels intense and may take about a week to get used to the energy-rendering sleep very light or periods of wakefulness not normally experienced, although the majority of persons on installing these devices sleep better from the outset. Geophatic stress is a condition inside or outside a building where the naturally occurring chi is drained or low. This has been detected with devices such as an electrostatic detector where electrostatic draining occurs more rapidly in G/P stressed or drained places. The term feeling drained is interesting and relevant…..it is established that there are electric fields surrounding the body and these change when one enters e.g. a building with a high ceiling. Also being outdoors produces a different head to foot electric field potential compared with being indoors. In a G/P drained room or house these electric fields are depleted around the person and this in turn is hypothesised to effect the overall orgone/chi of the person and will show up to a skilled acupuncturist as low vitality pulse readings. The feeling from the orgonite devices is the opposite of draining. The energy is felt by sensitive persons and persons with good self observation as uplifting, charging and a feeling of fine or even tightening energy. The main disadvantage of orgonite devices is their cost, typically around £100 for one of reasonable power. There are also some plug in devices that are sold as negating geophatic stress. One popular version of these seems to work for a period then to work less effectively. They are also rather expensive and in my opinion do not offer such a balanced and vitalising field as orgonite devices. Using a charcoal with steel impregnated pendant as described above. These are simply placed on a surface such as a table or chair with the concave side up. A quartz crystal is then placed on the concave (top) side One can easily change the crystal e.g. for the highest energy use clear quartz, for an energy good for the brain and insomnia use amethyst quartz or for an energy related to the heart chakra - possibly this may distribute around the body better, use rose quartz. You can also experiment with combinations of crystals but I suggest not more than 3 are used as two many different energies at once will produce a heavier less uplifting energy, so changing single crystals periodically is probably he best route to go if you are inclined to experiment. Pure quartz is the basic one to use but if you are sensitive it will be easier to adapt to the energy of amethyst or rose quartz first, although using a small quartz crystal of e.g. 5 to10 grams at first and after adaptation occurs you can replace with larger crystals. Months of testing using charcoal as a chi concentrator left me with the conclusion that charcoal in a very good material for attracting and intensifying the chi within the local environment, and that adding metal, preferably steel as recommended by William Rich for his bio-compatible orgone generators, modifies and intensifies the chi in a beneficial way. Any crystal placed immediately near or on this resultant field is ‘pumped’ with the chi or orgone energy. The energised crystal then radiates across considerable distances depending on the size of the crystal and to some extent the mass of the charcoal and steel present. It may be a mistake to think of these devices or any other orgonite devices as radiators of orgone energy as such. The increased chi or orgone is concentrated only locally i.e. within a few inches of these devices, but crystals when exposed to light also sound or electro - magnetic energy or orgone energy radiate out a considerable distance. So the energy involved in orgonite devices or room chargers we can call orgone charged crystal energy field . And it is very different from orgone energy applied locally to the body such as via an orgone accumulator or pendant. My feeling is that the orgone charged crystal energy prevents the chi/orgone draining effect occurring due to geopathic draining and electromagnetic stress by adding a kind of structured electrostatic or related energy to the bodies bio-plasmic field/energy field and also to the room’s field. I have found that supporting and strengthening the bodies chi with a chi/orgone pendant enhances the bodies overall energy field (also reduces geopahtic draining) but feels very different from using a orgone charged crystal field. This gives us two distinct methods of overcoming geophatic draining and enhancing our energy fields. The strength of the field drops off with distance. Experience so far indicates that if the device is within about 6 feet of the body, a good strong energy uplifting effect occurs. Persons who are sensitive will feel this during the adaptation period but no longer notice this once adaptation fully occurs. Therefore, example use is to place in room where one is habitually in the day e.g. in the living room or office within 6 feet, and then place in bedroom at night, within 6 feet of the bed. One can of course use more than one room charger and place one in each room that is habitually used. Sometimes geopathic or electromagnetic stress is dominant in one room and it is especially important to have a charger in that room if habitually occupied. For small houses that do not have concrete or brick internal wall dividers one charger may be all that is required to charge the whole house when using a larger crystal eg approximately 25 to 35 grams in weight i.e. about 1 " to 1 1/2" long and wide. Adaptation to the energy charging into the room/house where the room chargers (s) are employed takes typically about 4 to 5 days. So for sensitive persons who may sleep more lightly or less hours when the charger's are introduced should bear this in mind: although it may take longer to adapt for some individuals who have very blocked chi. The majority of persons, however e.g. about 80% will sleep better quality from day one, especially if they are geophatically drained/stressed or electromagnetically stressed from electrical equipment/house wiring/ mobile phone use or proximity to mobile phone masts and especially cordless phones. A sudden change from a period of sunny weather to stormy and rain makes almost everyone feel relaxed or even drained. This is actually due to a sudden reduction of chi/orogone in our local environment, and is a different, but related phenomena to airborne ions. The orgone or chi field that surrounds us all effects our own orgone or chi status. Especially important to understand is that the orgone field is easily effected by electromagnetic radiation. This is rather how a loudspeaker will resonate to whatever sounds are induced in it. And like music from our music system, It can be beneficial or harmful, uplifting and calming or draining, or even toxic. Orgone is disturbed and agitated as Reich puts it, by man made electrical radiations from the common household mains frequencies emitted by all our electrical devices to the more energetic and disrupting frequencies of mobile phones, mobile phone masts and so on. For example a mobile phone mast can be quite a distance away but the orgone can be disturbed for quite a distance and this will interact will your own local orgone fields. Orgone is greatly effected by the slightest amount of radiation turning it bad, yielding negatives properties, and this deranged orgone can have severe effects on the health even though the actual radiation levels as measured with a Geiger counter are within established safety limits. So Reich's work gives us a broader understanding of how electro-magnetic effects and geophatic factors can effect us. We are all effected by these things, we cannot get away from them unless we find a very remote place to live as a hermit and not have a mobile phone or electrical equipment. In such a place the local landscape, and tress will help to create a most beneficial calm orgone field. The good news is that since Reich's death advances have been made and it has been discovered how to correct deranged and unhealthy orgone fields and in doing so our own orgone or live energy or chi is harmonised, uplifted and raised in protective energy. We do 'adapt' to all this energy disruption that has been discussed, adapt in the sense that we are not generally aware of it's effects and seem to cope with life, unless we actually develop health problems, but we are all insidiously effected. We can understand this once we see the effects of installing a room or house charger or other suitable orgonite based device. Example 1. A seemingly well young person working at the computer most of the day also with constant exposure to mobile phone next to him plus all the other normal local derangements of the orgone field etc. On sleeping in a room with a room charger installed from night one onwards, sleeps better and more refreshed on waking, becomes less stressed in the day, more organised and calm and suddenly decides to cut out smoking and reduces smoking considerably by day 2 of using the room charger. Electromagnetism and the knock on effects of deranged orgone stress have an enervating effect on all our systems including our emotions and mentality as well as our immune system and ability to absorb nutrients. Example 2 persons living in a geopathically drained house, argue and struggle to get on in their relationship. Chronic sickness is common with many persons who have lived in the house over many years. When sleeping in another house energy and mentality begins to improve. The general consensus concerning the effects of orgonite devices in general from 3 years of observations and first-hand reports by 1500 plus persons from all over the world, communicating by chat rooms, message boards, and email is distilled below in point form. You can use the same basic device to enhance meditation, reduce stress or assist physical healing by strengthening and cleaning your body’s bio-energy fields. Many people now place them under their beds. Another popular use of them is in the home garden, to increase the overall vitality of plants growing within a few feet of the device. Many of us have noticed beneficial changes in the emotional state and general behavior of people & animals within the effective range of such devices, whether they are aware of the devices presence or not. They are, in effect - getting the same sort of emotional healing and balancing (and in some cases the commensurate physical benefits) that one would expect from more traditional methods of life energy therapy such as reiki or dowsing or treatment with radionics.